The wait is over for all the iPhone fans, Apple has raised the curtains from its newest smartphone iPhone 5 at the event in San Francisco. The newest iPhone looks amazingly like those leaked pictures of the phone which were revolving around and considered fake. iPhone 5 is worlds thinnest smartphone at 7.6 mm which is also 18% thinner than its previous version. The smartphone is made up of only glass and aluminium enabling it to be 20% lighter than its predecessor iPhone 4S. As predicted by us, iPhone 5 gets bigger with 4.0 inch retina display embedding 1136 x 640 pixels and 16:9 aspect ratio. The display provides 44% more color saturation and integrated touch which means there is no extra layer of touch on the display. Coming to the connectivity part, we predicted that it will have 4G LTE and yes it does have LTE. But it has got alot more than that in terms of wireless speed as iPhone 5 gets the new WiFi that is 2.4 GHz and 5 GHz on 802.11n providing greater speeds. Sprint, Verizon and AT&T will be providing LTE services for iPhone 5 whereas in Canada it will be Rogers, Telus and Bel. The connector which we talked about in our previous post has got a overhaul, its now called Lightening and has got faster and smaller in size. Its amazingly 80% smaller than the previous 30 pin connector which has been used till now. Apple has worked on every part of iPhone and same goes with processor too, iPhone 5 sports a new Apple A6 chip that provides 2X faster processing speeds than its predecessor A5 and also 2X faster graphics. Apple got Rob Murray from EA to show the graphics power of iPhone 5 as he demonstrated the Real Racing 3 games console like graphics on the smartphone. One of the great features of iPhone 5 is the Panorama mode in the 8 Megapixel iSight Camera. You can take amazing panorama pictures with just a slide and the demo pictures that were shown at the event looked really awesome. 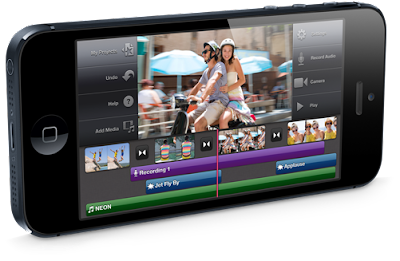 You can take full 1080p HD videos with better stability and can even shoot a video while taking pictures. With iOS 6 comes some new and useful features, like shared photo streams, full screen mode in Safari, built-in search engine to find POI's, turn by turn navigation Maps app and 3D modelling of buildings on the map which works similarly like the Google Maps 3D View. Apple is also offering free iOS 6 upgrade to users with iPhone 4, 4S, 3GS, iPad 2 and the new iPad. iPhone 5 will be available in three 16/32/64 GB versions which are priced at $199, $299, $399 respectively. Pre-orders for iPhone 5 starts September 14th and will start shipping from September 21st.